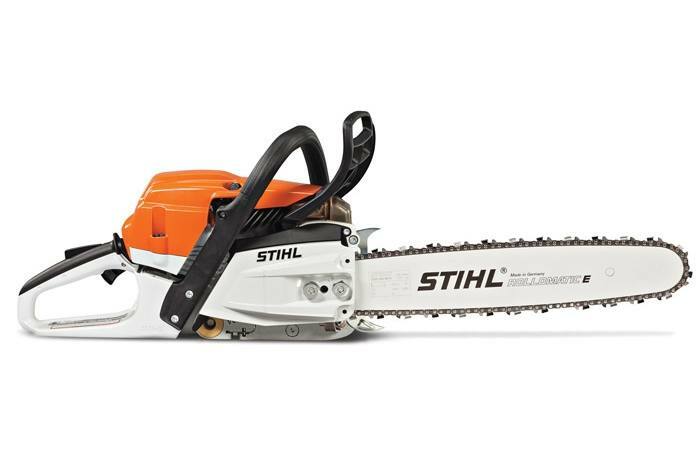 This chainsaw offers an optimized power-to-weight ratio, great fuel efficiency and convenience features. The MS 261 chainsaw delivers low emissions, high fuel efficiency and, of course, professional-grade performance. Its redesigned cylinder and ergonomic housing deliver a great power-to-weight ratio, weighing just 10.8 lbs. Designed for large volume cutting, the MS 261 also features our anti-vibration system for enhanced comfort. Other convenience features include pre-separation air filtration system and a redesigned spiked bumper. Add the MS 261 to your jobsite today. STIHL ElastoStart™: The ElastoStart™ starter handle is an exclusive feature of STIHL. It is a starting grip with a built-in shock absorber that helps reduce the effort when pulling on the starter cord. The ElastoStart™ starter grip noticeably reduces the sudden peak forces (compression) normally felt during cranking. The forces which occur at the grip after the first compression stroke are smoothed out. STIHL Quickstop®: STIHL chainsaws are equipped with a chain stopping system designed to reduce the risk of injury in certain kickback situations. It is called a STIHL Quickstop® chain brake. The STIHL Quickstop® chain brake is designed to stop the rotation of the chain if activated by the operator's hand or by inertia if the saw kicks back with sufficient force. In some working positions, the STIHL Quickstop® chain brake can be activated by inertia, stopping the chain within fractions of a second. Ematic™ Lubrication System: The Ematic™ guide bar, when used with STIHL OILOMATIC® saw chain, will provide proper lubrication and less oil consumption than conventional methods. The system works because two ramps, strategically placed in the guide bar rail, help contain the flow of oil and direct all lubrication to the sliding faces of the bar and chain links as well as the rivets and driver holes, which in turn can reduce bar oil consumption up to 50%. STIHL recommends #3634 (26 RM3 67) OILOMATIC® saw chain and 16" 3003 008 6813 Ematic™ guide bar combination. The actual listed guide bar length can vary from the effective cutting length based on which powerhead it is installed on. (314) 727-1171 7711 Page Ave.